The Amazing BUSHAGON!!! Master of DECEPTION! Warper of REALITY! 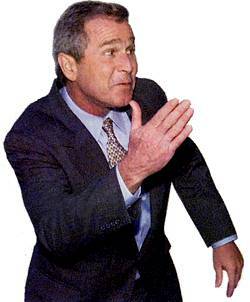 Bush doesn’t use scientific methods in analyzing information and making policy decisions? Who knew? WASHINGTON — More than 60 scientists, including 20 Nobel laureates and several science advisers to Republican presidents, on Wednesday accused the Bush administration of manipulating and censoring science for political purposes. In a 46-page report and an open letter, the scientists accused the administration of “suppressing, distorting or manipulating the work done by scientists at federal agencies” in several cases. The Union of Concerned Scientists, based in Cambridge, Mass., organized the effort. The protesting scientists welcomed his response. “If an administration of whatever political persuasion ignores scientific reality, they do so at great risk to the country,” said Stanford University physicist W.H.K. Panofsky, who served on scientific advisory councils in the Eisenhower, Johnson and Carter administrations. • Ordered extensive changes to a section on global warming in the U.S. Environmental Protection Agency’s 2003 Report on the Environment. Eventually the entire section was dropped. • Replaced a fact sheet on proper condom use prepared by the Centers for Disease Control and Prevention with a warning emphasizing condom failure rates. • Ignored top Department of Energy nuclear materials experts who cautioned that aluminum tubes being imported by Iraq were not suitable for making nuclear weapons. • Established political litmus tests for scientific advisory boards. In one case, public health experts were removed from a lead-paint advisory panel and replaced with researchers who had financial ties to the lead industry. • Suppressed a Department of Agriculture microbiologist’s finding that potentially harmful bacteria float in the air around large hog farms. Russell Train, an EPA administrator in the Nixon and Ford administrations who spoke on the protesters’ behalf, described the Bush administration’s treatment of science and scientists as so “dictatorial” that it was causing good scientists to leave the federal government. James Zahn, a former Agriculture Department microbiologist, said he discovered accidentally that pig farms in southwestern Minnesota, northern Missouri and Iowa were emitting airborne bacteria. Because pigs are often fed antibiotics, Zahn speculated that airborne bacteria from farms could include drug-resistant bacteria, which, if breathed by humans, would make them harder to treat when ill.
Zahn presented his findings at a scientific conference in 2000, but the Bush administration stopped him from publishing his data 11 times between September 2001 and April 2002, he said. When Danish researchers sought to learn more about his work, Zahn wasn’t allowed to share his techniques. “It was truly a new problem with potential impact on human health,” Zahn said. This entry was posted in Politics, Science & Nature.